My friends, I have discovered a new sewing term: Theoretical Clothes. You may wonder what it means. Well, my friends, that is my new name for my stash. You see, in theory, these pieces of fabric can be made into clothes that I or the recipient can wear. Ergo theoretical clothes. Considering how long it takes to fit a pattern, how long it takes to tailor a coat or a jacket, and generally how slow of a sewist I am, I feel a slight desperation about my ability to accomplish all that I want to do. I know my theoretical clothes (aka stash) is small compared to others, but it is still way too much for what I can actually make in the time that I have to sew. And that depresses me a little. My day job is getting in the way of my sewing. Anyhoo, just wanted to share my new sewing term with you. I didn’t get to work on my coat last night as my mom is visiting. I hope I will have some sewing time this weekend, but I am not sure it will happen. My toast to you all: May you have lots of sewing time! P.S. I accidentally bought some more fabric from the Fabricmartfabrics.com sale and I received an email from Elliott Berman about their amazing sale. I’m doomed! This entry was posted in Stash. Bookmark the permalink. It’s almost impossible to resist. I know how you feel. Don’t worry if you feel you are slow sewing, just wait a few months and you’ll find you will be doing things easily that you previously thought hard. It’s while you are learning new stuff and putting it into practice that it feels slow. I don’t know how to get you extra sewing time ;). 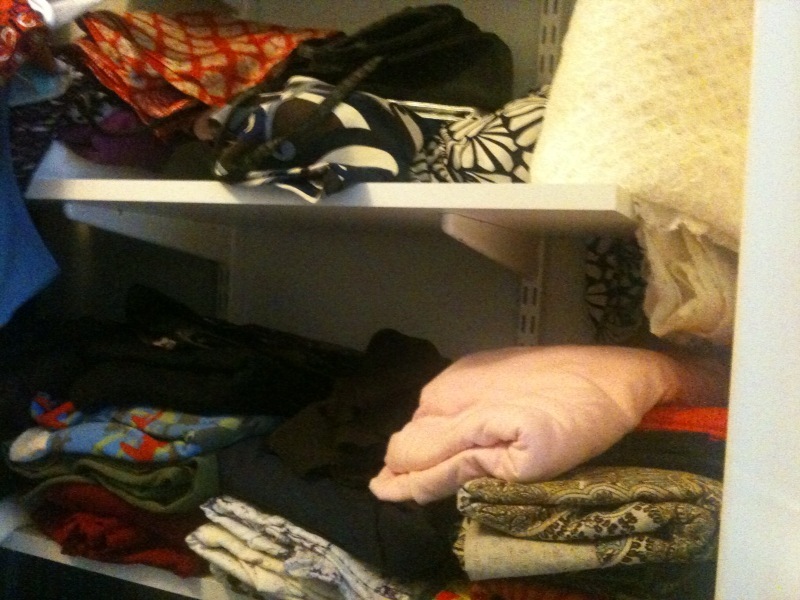 I have a cupboard full of Theoretical Clothes too!! This is a great term (big grin). It’s much more positive than stash. 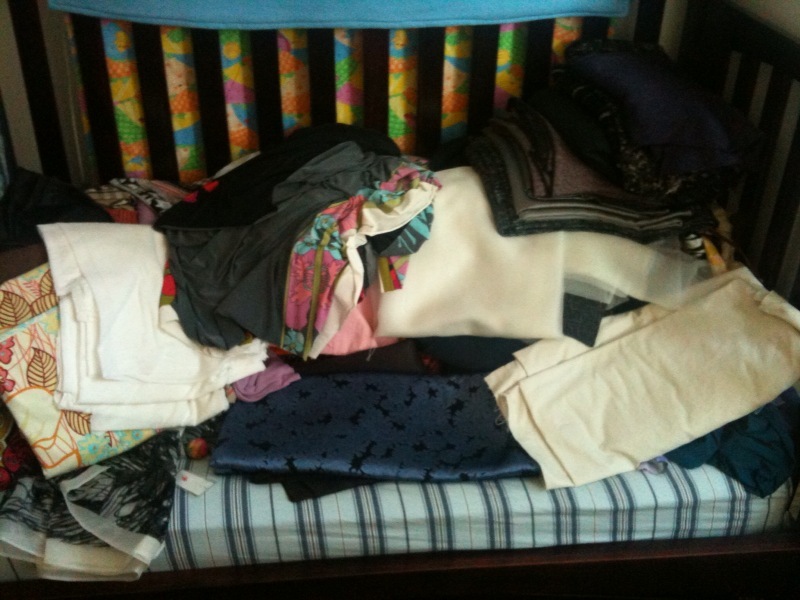 It doesn’t imply that fabric is being wasted, but instead the boundless possibilities of more clothes. I know the feeling…except I also have a theoretical sweater stash! Now that I will be taking the train every day for half hour each way I should be able to work on that. I haven’t been sewing as quickly now that I’m working with wovens and trying to do things right with them. I’ve learned that there are really no shortcuts with those, unlike knits. BTW, I fixed the invisible zipper on my suit skirt and sewed in the lining last night. Now just to do the hems. I decided to keep the Viking as I found that one of my extra presser feet I bought (a regular zipper foot, but a longer, skinnier one that allows you to get super close to the teeth) works PERFECTLY for invisible zippers. So I’m glad I didn’t break up with that machine now. Sigh. Yeah. I too bought (this morning) from the FarbicMart sale. And, I have more theoretical clothes than I care to cop to. In fact, I just borrowed a dress to wear to a wedding next week because I know I don’t have tim to get it done. You are so right. I have a huge theoretical wardrobe! If only they were on hangers. Sigh…my day job is getting in the way of my sewing too. No sewing today…just work. I’m sewing vicariously through reading blogs and patterns. I feel your pain on the lack of time thing. Can I just say I am blown away at how much you DO finish and how fast you HAVE developed considerable skills. And you do it with a small child. I confess I was not wise enough to make my own creative pursuits a priority at that time in my life. You are wise in your choices – never forget that! Theoretical clothes sounds much nicer than stash! When I look at my fabrics, I see the finished garment I am planning anyway, so it really makes sense! You have a fine wardrobe of theoretical clothes! Ha – I love that!